Book now: Lunya Manchester's epic festive tapas banquet for £28.95. Leading Spanish restaurant and deli group, Lunya, reckon they’re offering the North West’s best Christmas dining experience across their three Manchester and Liverpool outlets. And, in all fairness, they do seem to have thought of everything when it comes to creating an epic Christmas experience. The Manchester branch has a great location, just off Deansgate in the historic Barton Arcade. Inside, there’s a authentic deli (the best in town in our opinion), a proper Spanish wine store and bar (with a gin and tonic bias), with a spacious restaurant and private dining room on the first floor. Christmas catering is available for groups of two to 120, and exclusive hire is an option. 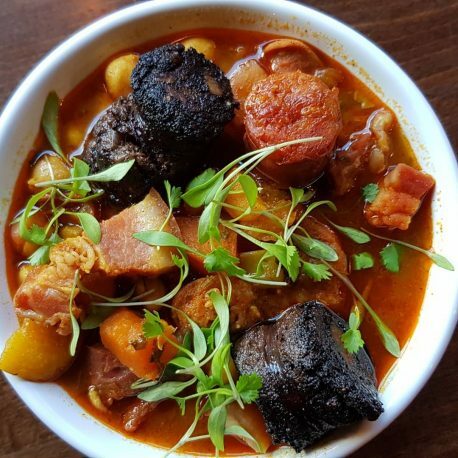 Bespoke menus could include giant seafood paellas and whole roast suckling pigs (price on request) – or go for the set Festive Tapas Banquet (£28.95pp, or £32.90 with a Christmas cocktail – including hats and crackers). The selection starts with snacks from the deli bar (olives, habas picantes and kikones), fine Spanish meats and cheeses and Catalan tomato bread. Enjoy a pre-main course of tortilla with a sage and onion allioli, roasted dates stuffed with blue cheese and wrapped in smoked panceta and chorizo sautéed in white wine with fennel seeds (or padron peppers for veggies). The main event is a rich Catalan beef stew (‘Estofado’) with cinnamon and orange served with parsnips in PX sherry, chestnuts and patatas bravas. The veggie option is woodland mushrooms, sauteed with asparagus and extra virgin olive oil. Sharing desserts include crema Catalana, chocolate con churros and tarta de Santiago with Christmas pudding ice cream. There’s tea or coffee with fig and brandy truffles for £3.25 extra per person. Places are limited, so if you like the sound of this, book by calling Lunya direct, or emailing them manchester@lunya.co.uk with your preferred party size, time and date. A Manchester Wire partnership post.